Wish you Merry Christmas and a prosperous New Year! It's already 10 years since I wrote the first newsletter back in 2007. During these 10 years, fad diet changes from low fat low calorie, low carb, to today's vegetarian/vegan and ketogenic-diet. 10 years ago I was surprised to see that my colleague, a young engineer threw away egg yolk when eating an egg. Now expert said that eating a whole egg everyday won't threat our heart. Passionate foodies already know how to cook Chinese dishes/snack that even many young Chinese don't know such as Beijing spring pancake. And the same, Chinese foodies can cook very fine and mouthwatering western cookies and cakes. We should thank the internet. I studied Traditional Chinese Medicine for 10 years, and finally got a certificate. I decided to concentrate on Chinese dietary therapy, I call it TCM Food Therapy-using whole food to keep health. We don't need to take medicine by only using whole foods and a few simple natural herbs. I didn't take western medicine for 10 years. How are you? What happened to you for these 10 years? China's five-thousand years of culture and history reserved precious regimen. I'm digging out and would like to share with you. 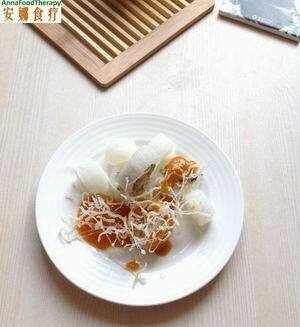 So this website, including this e-zine is not only about Chinese recipes, it's more about healthy life style. 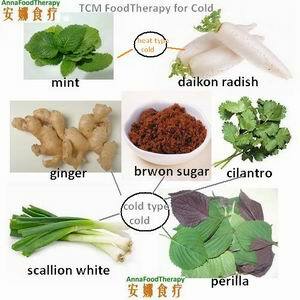 To prevent and treat cold with food, we have to know what's cold-type-cold and heat-type-cold and related foods and herbs. In holiday season we travel frequently and eat a lot of high energy foods, which tend to cause excessive internal heat in the body. But the temperature is very low outside especially in the north.What should we do in this situation? Please check here to see the details. This healthy vegan recipe helps to regulate metabolism, good for those who are with diabetes, obesity, hypertension, or heart diseases.